If you are a new user to the music creation on the computer, a good program to start with is FL Studio. The demo version of this program should suffice for this tutorial, and will possibly give you a good look at the program before you would ever consider purchasing it. To get the demo, click here. The version of FL Studio we are going to use is FL Studio 7. (although any version should work fine) Okay, first things first. 2. You are going to want to go to File -> New from Template -> Minimal -> Club Basic. 3. Next, you are going to want to find the “Kick” channel. This should be found easily, but here is an image to show you what exactly I’m talking about. 4. Add four kicks by clicking once on each one of the packs of four blocks that are color coded. That sounded pretty scrambled even to me, so here’s another image. Ok! So far, we’ve created a new project file, set up a basic template, and added a 4/4 kick drum. This is the classic making of many electronic genres! So we have a drum! That’s not really enough to call this a loop, so let’s add some bass to establish a chord progression. This might also be a good time to note, that Wikipedia is a life savor if you get stuck with any terms I forget to define. 5. Now, I will help you make this first bassline! This is a common thing in trance music. To start this, we need a bass voice (a voice is simply a synthesized or sampled channel.) To create a simple bass that is available in all versions of FL, navigate to Channels -> Add one -> BooBass. A new channel beneath the four initial ones should be created title BooBass. From here there are two ways of going about the process of adding the bassline. You can either go with the easy, but less flexible way, or the harder but completely configurable way. I’m going to show you both, but I strongly suggest you go with the latter of the two, as it will establish better habits for later. 5b. So I see me calling it difficult hasn’t dissuaded you. Great! Now I will show you the magic of the “Piano Roll!” This piano roll is much more powerful than the clumsy bar editor, and you can do a lot more with it so: here we go! To start, right click on the blue channel named BooBass. Then, select Piano Roll (or Send to Piano Roll if coming from step 5a.) Now you should see a confusing box. To the left side there should be either a keyboard, or the names of notes depending on the demo version you obtain. Either is fine. Now, you should see columns in the main part of the window that are numbered. Now follow this image here to create what is pictured. Left click to create notes and drag on the edge of them to resize them. 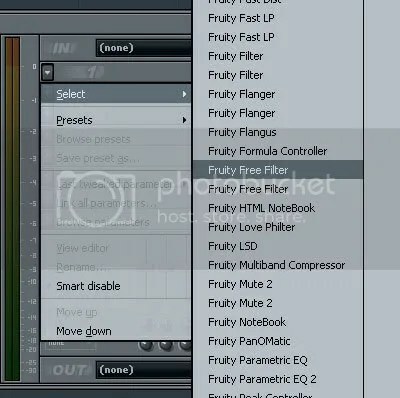 Now, a new box labeled “Fruity Free Filter (Kick)” Should come up. Adjust the Freq (frequency) knob until it reads 145 hz. Now you can close this window and the mixer window. Hit play again at this time to hear what that did. If you want, you can allow it to continue playing and mess with the frequency knob while it loops. This will give you an idea of what it is doing. 8. Congratulations, you have created your first loop in FL Studio! Of course, MUCH more can be created when you let yourself go in FL Studio! Here’s my page on Newgrounds for examples. Hope you didn’t get lost and have fun creating music! All images and the FL Studio, Fruityloops, and BooBass name and logos are properties of Image Line. Hey, this is great! Thanks for tutorial; I saw that someone was using it to make tunes, so I decided to give it a shot. When I opened it up, the whole thing was a little overwhelming. But now that I know this, it makes things a lot easier. Thanks for the wonderful tutorial. Really helped me a lot! 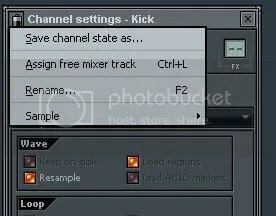 How can I remove a ‘channel’ from the mixer once I’ve added it? For example I sent ‘Clap’ to the mixer, but if i want to delete clap, then how can I remove it from the mixer slot as well? Right click the “Clap” mixer channel, go to file, then hit browse mixer states. Find default on the tree-view list to the left and right click that, and hit load to selected channel (or something along those lines.) That will set the mixer channel back to its default state. However, if clap is still being sent to that mixer channel, you will have to go to clap and drag the number in the upper right back to the hyphen which sets it to go straight to the master track. Thanks,finally something usefull explained so a complete novice like myselfe can understand. Thanks! I tried to make it as step-by-step as possible. The idea being that once you get a foothold into the basics it will be easier to follow through to learning the rest of the program. Likely pattern 1 is still there. Whenever you switch to pattern 2 all the note information will dissapear because pattern 2 is empty. If you switch back to pattern 1 you should see what you input originally. This tutorial note was very very helpfull..
plz add more tutorial about electro mixing & remixing in FL studio..
Hey man thanks for the tutorial but please tell me what channels and plugins i can use to make a dubstep effect if u know what i mean. .please please! nice tutorial man but please can you tell me what channels and plugins to use to make dubstep sounds please please!. . A lead would be the instrument that plays the main melody of the song. In rock music you can have a lead singer and a lead guitar. Then there are rhythm guitars which play accompaniment to the song but not the main melody.